CAPITOL HILL — The Navy has ruled out breathing air contamination as a cause of physiological episodes, but a complex set of conditions – including both cabin pressure issues and human factors – has led to the rates of pilots experiencing PEs this current fiscal year being back on the rise. Though the service has not yet pinpointed a cause – and likely won’t ever find a single root cause – other gases or contaminants have not been found in breathing air coming from the jets’ Onboard Oxygen Generation System (OBOGS), the Navy said in a little-publicized news release this week. Despite that progress in ruling out a major factor – and one that was widely blamed for PEs early on when rates among pilots began increasing sharply – two admirals today told lawmakers that there is still much work to be done in stopping the episodes, which can lead to pilots experiencing symptoms of tingly fingers and toes to headaches to passing out in the cockpit. 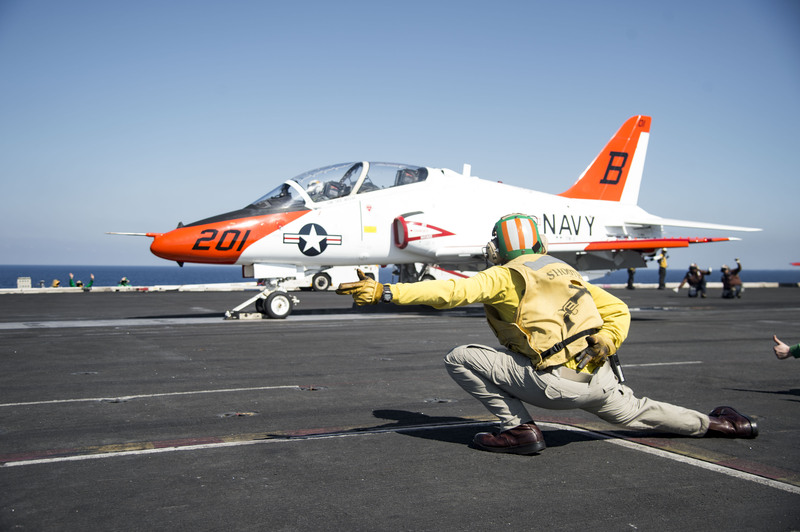 Rear Adm. Scott Conn, the Navy’s director of air warfare (OPNAV N98), told the House Armed Services tactical air and land forces subcommittee today that physiological episodes among student pilots and flight instructors in the T-45C Goshawk training aircraft are down. Personnel flying the T-45 experienced 35 PEs in 2016, 31 in 2017 and just six in 2018. So far this fiscal year, which began Oct. 1, only one PE has been reported in the T-45. “That is progress,” Conn said, noting that the flow of air into the OBOGS system was reworked to allow for a more constant flow of air without any fluctuations, which appears to have reduced the PE incident rate. 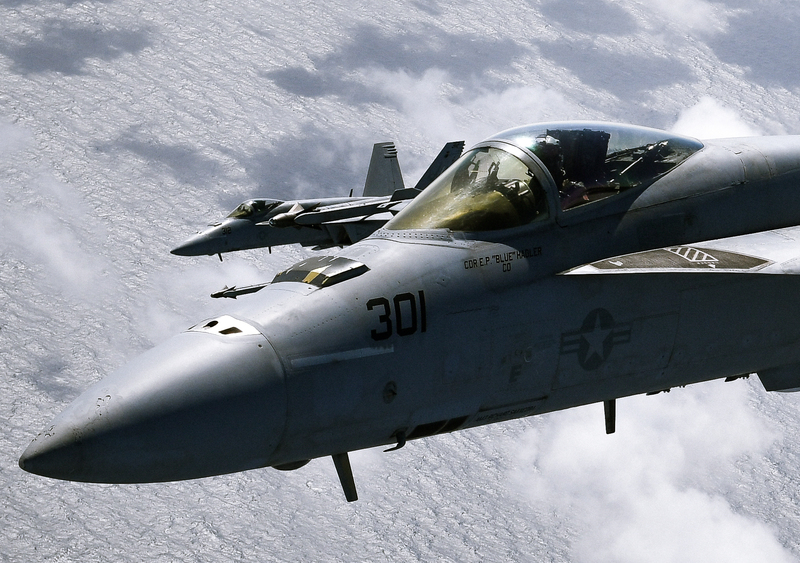 The story is different in the F/A-18E/F Super Hornets and EA-18G Growlers, where cabin pressurization and fluctuation appears to be the key driver of PEs. Among the one- and two-seater Super Hornets and the Growlers, Conn said there were 87 PEs in 2016, 73 in 2017, 65 in 2018, and already 41 in this fiscal year, which is just halfway over. “Any progress we’ve made has flattened out,” Conn said. “The good news is, we know what we need to do,” which includes addressing primary and secondary bleed air regulator valves and other components to allow for a more stable air pressure and oxygen level in the cockpit. “We can connect that those systems are driving PE events. Some of those are under contract and will start delivering this year, others of those gear will start delivering in 20 and we’re going to install that on the airplane,” Conn said, adding that cabin altimeters to warn crews about pressure fluctuations before anyone experiences any symptoms are also being installed now through 2020 into all the jets in the fleet. “From a PE side, we’ve ruled out contamination. We’ve had the engineering to address the T-45, it is in place and we’ve driven down numbers,” Conn concluded. As for the Joint Strike Fighter, “F-35 has experienced on average the same or slightly less rate of physiological events that other aircraft have,” Vice Adm. Mathias Winter, the program executive officer for F-35 Lightning II, said at the hearing. Winter described three technology areas the PEO is pursuing to get ahead of any potential increases in PE events in F-35 pilots. First, on OBOGS, “we found that it was providing the appropriate concentration of oxygen to our pilots, but there was a variation in it that, if we reduced that variation, would eliminate a potential causal factor,” Winter said, and added that the program was working to eliminate that variation so they could focus on other potential causal factors. Second, the F-35 has a sensor in the seat that measures cockpit pressure and immediately initiates emergency oxygen if it senses the pressure is too low. “It was too sensitive, so we’ve gone back and looked at that based upon pilot input, and we’re doing a seat portion assembly upgrade,” he said. And lastly, the F-35 program is adding a more sophisticated carbon monoxide filter, despite gas contaminants not being an issue on the Super Hornet and T-45 jets. All three will be included in new jets starting with the next contract, Lot 12, and will be retrofitted into all jets already built starting next quarter, Winter added. “I’m encouraged by the progress being made as well as the amount of resources requested by the Navy in Fiscal Year 20: approximately $278 million in the areas of upgrading the aircraft, changes in air crew education and training, improved maintenance practices, and bringing in the medical community to better understand the human dynamic,” subcommittee ranking member Rep. Vicky Hartzler (R-Mo.) said at the hearing. That human dynamic, though, is proving challenging to address, with Winter calling “human being makeup” a top determination as to which pilots experience PE symptoms and which don’t. Experts have previously said that factors such as rest and hydration play a role, and Winter added one more: flight experience. “More experienced pilots seem to have less incidences of physiological events. There’s not a direct causal factor drawn by that,” he said, but he noted that more PEs have occurred in the aircraft assigned to training units versus operational units even though they are the same aircraft. The Navy said this week that two Root Cause Corrective Action (RCCA) Core Teams – one for F/A-18 Hornet and Super Hornet and EA-18G Growler jets, another for the T-45 Goshawk training jet – have been trying to rule out potential causes, and they “determined last fall that the quality of pilots’ onboard oxygen was unaffected by asphyxiates, carbon monoxide and external or internal contaminants, such as fuel vapor or pyrolysis byproducts, respectively,” according to an April 1 news release. “We are happy to see that contamination has been ruled out and that all Navy aircraft are delivering clean air to our aviators,” Rear Adm. Fredrick Luchtman, Navy lead for the Physiological Episodes Action Team (PEAT), said in the release. As the rate of pilots experiencing physiological episodes increased in recent years, attention turned to OBOGS. Lawmakers grilled aviators during hearings about what was being done to study and find fixes for OBOGs. The Navy news release also notes that OBOGs contamination was an early assumption made in the absence of alternative explanations. “Contamination was an explanation for people getting sick in the aircraft when we couldn’t explain it very well,” Don Salamon, deputy assistant program manager for system engineering for the F/A-18 and EA-18G Program Office, said in the news release. Still, both the F-18 and the T-45 teams ruled out that possibility after a 16-month effort that looked at 21,000 samples taken across 11 sites from pilots’ breathing gas, ground sampling and blood analysis. “We’ve gotten smarter, and now we understand there are other things that could be happening that manifest as those symptoms, but it’s not exposure to contaminants,” Salamon said. The two teams’ attention is now turned to two other factors: cabin pressure and breathing dynamics – a pairing that highlights the complex man-machine interactions that happen while flying a fighter jet and the difficulty in finding a single cause when conditions in both the machine and the human are potentially contributing to a physiological episode occurring. The teams are looking at “the maintaining of cabin stability by preventing unexpected pressure fluctuations that have been correlated with PE events but not yet shown to be a causal factor,” and “breathing dynamics and factors that can impact gas exchange during respiration, such as hyper/hypocapnia, hypoxic hypoxia, work of breathing, and adsorption/acceleration atelectasis,” according to the news release. “There is likely no single ‘smoking gun’ that will be found as a result of the investigation,” Salamon said.